16oz. (500ml.) Brown & Tan with Bamboo & Blossoms Pattern. 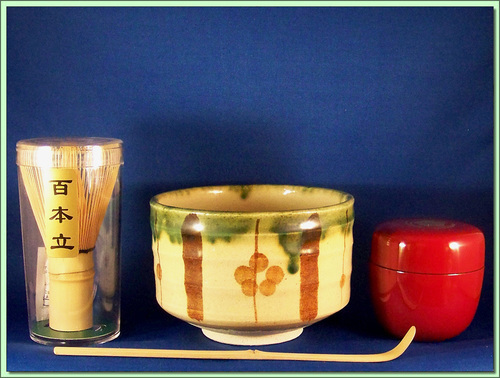 This tea ceremony set is made especially for use with matcha powdered green tea. It can be used with catechin as well because both are powdered teas that can be put directly in the cup, hot water added and then stirred with the wisk that is included. The set comes with one bamboo Chashaku (Scoop) 7-1/4", one bamboo Chasen (whisk) 80 count, one laquer Natsume (container) 2 1/2" and one Chawan (bowl) 4-3/4"w X 3"h. Makes a great and unique gift! For a limited time you can choose between red and black Natsume. Makes a great and unique gift!Try our Japanese Green Tea matcha with this set.